The location was across the narrow street almost at the site of the Seven Young Ladies in Red Dresses near Dulles Airport in Virginia. The "Take it! " almost needs no explanation. The overwhelming immediate attraction of so many grand things happening at once had me pulling into the adjacent parking area as soon as possible. It was a Saturday, there was no one else there but me. 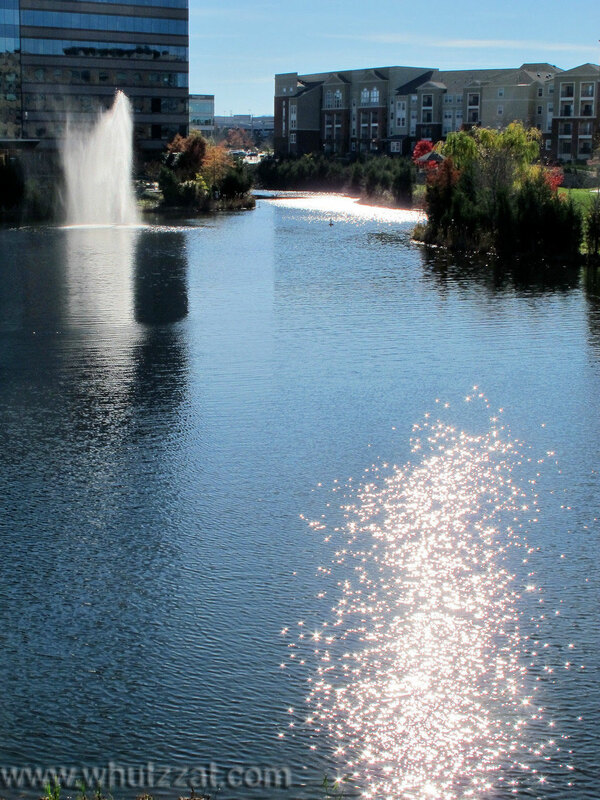 I got out of my car and immediately began snapping pictures as the slight gusts of wind kicked up the water; just the right amount to enable the sun to pick up from there and create the glitter off the surface. The glitter path varied in length outward into the lake, but always seemed to remain as a constant at the foot of it next to the shore line where I was standing. As I walked along the shore line the glitter path moved right along with me. I feel certain there has some sort of scientific explanation, but for the layman, it was eerily wonderful. I spent about an hour savoring and walking at the edge of the water. I went up on a bridge at the foot of the lake and was honored with the presence of a very small leaf dance. There were not many leaves involved as most had been picked up by the excellent maintence crew that cares for the grounds in this executive park; but enough to have me overwhelmed with its contribution to the comprehensiveness of the unexpected enchantment of the setting. The return walk back to the car had me focusing on the shifting plume that the airiating fountain had become. Such strength mixed with delicacy, a sort of throw it up in the usual way and look what nature has done to it, simply amazing. The After Take: Within two hours I was in downtown Alexandria Virginia at a branch of a big bank in which I have several accounts asking the teller if they had some information on how I could get started with online banking (this tells you how slow I am to get going with many things). She said they had printed information but would rather have one of the administrative people spend some personal time at a computer right then and there. She called and a very nice young lady greeted me and escorted me to her desk to show me the way to set it all up. We stopped at her desk and I looked at the name plackard on the desk and saw it to have the first name "Sparkle." I almost needed oxygen. I told her of my recent experience, and showed her several of the lake shots via the small monitor on my camera. She was very complementary of the photos and proceeded to sit me down (which I needed at that point) and showed me how to do it all. I of course remembered none of it as I was still in shock. I went back the following Monday to take a picture of her name plackard just to make certain I did not make the whole thing up. I am contemplating making one of my small photo booklets up about this one. It was just too splendid to have been real, but I have the pictures to prove it to myself and share with you. Thank you for spending the time with me about this very special set of moments. Wow, I have never seen anyone named Sparkle before. This is a good one. Very clever. id luv 2 live in those apartments. EPIC view! I don't remember ever looking at this photo. What an unusual name for a person. 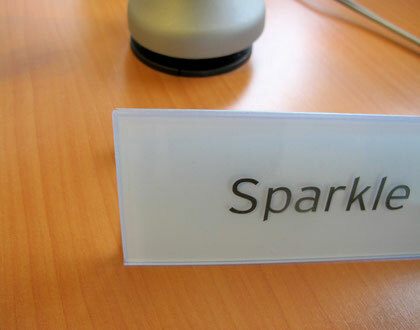 If I met someone named Sparkle I would assume they worked in another particular industry other than a bank.